The controversial post of actress Agot Isidro against President Rody Duterte went viral to social media. It drew different reactions from people all over the world. Antonio Contreras, a political science professor of De La Salle University Manila took to Facebook his two cents against Isidro's tirade to the president. Let me educate you Ms. Isidro. International relations is not as simple as you think it is. Countries do not behave like the soap opera characters you play where a bitchiness of one leads to a catfight, or a fistfight. You say we are not a superpower? My dear, we may not be but we are strategically located that countries like China and the US wouldl like to have a piece of us. Yes, Ms. Isidro. We have what many want except that we have been so effing loyal to the US even if it treats us badly in many agreements. Its about time we have to tell the US to treat us right since there are others ready and willing to take its place. 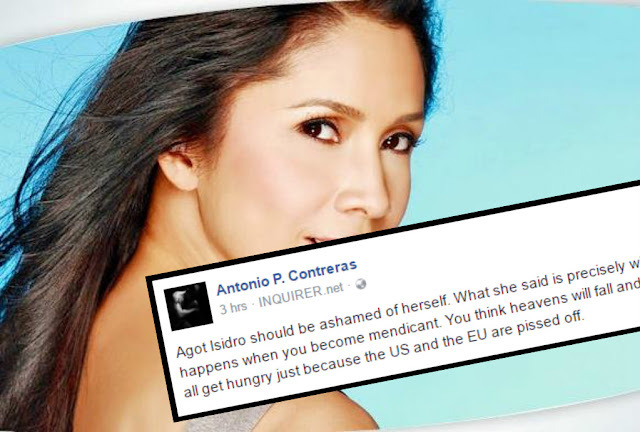 MUST READ: Cherry Pie Picache backs Agot Isidro: "May utak kami at paninindigan"
By the way, I am a political scientist. You may want to have a one-on-one with me on political literacy. You badly need it. You seem to be ignorant of the nuances of politics and IR. Don't worry, I will not charge you for consultation. I will do it pro bono for the love of country.